When Michigan residents die without making a will or other legal arrangement for their property, the probate court distributes their property according to Michigan law. Most people, however, have a different arrangement in mind for how to leave their property behind when they die. Making a will in Michigan makes it more likely your wishes will be carried out, and it may reduce the amount of time your family spends in probate court. Choose the format in which you wish to write your will: on paper, on computer, and typed or by hand. You may use any type of paper you wish, or you can use a preprinted legal form to guide you. If your will is entirely handwritten, you do not need to have witnesses watch you sign it. However, if any part of your will is not handwritten, you will need two witnesses to watch you sign, and they must also sign your will, according to Michigan Compiled Laws Section 700.2052. Write your full name, address and the date at the top of the will. Your address should include the city and state in which you live, and the date should include the day, month and year, according to FindLaw. You may include these items in the first sentences of your will if you wish, according to FindLaw. For instance, you may write "This is the last will and testament of," followed by your full name and address. Choose a personal representative. Your personal representative will be responsible for paying your remaining debts after you die and distributing your property according to the instructions in your will, according to Legal Aid of Western Michigan. Your personal representative can be any person who is 18 years of age or older and is mentally competent, according to Legal Aid of Western Michigan. Your personal representative does not have to be a Michigan resident. Include in writing that you want this person to act as your personal representative, using his full name. You may also choose a second personal representative, who will act only if your first choice is unable or unwilling to act as your personal representative after your death, according to FindLaw. Name a guardian for your minor children, if you have any. In Michigan, the custody of children who lose a parent goes to the other parent, unless that parent is also dead or is unwilling or unable to take custody. In that case, the guardian takes custody of the children until they are 18 years old, according to Legal Aid of Western Michigan. You may also wish to name a second guardian in case the first is unable or unwilling to take your children. List any specific pieces of property you wish to give to specific people, along with the full names of the people you wish to receive the property. The property you list can be personal items like furniture, jewelry or real estate, or it can be assets such as money, stock and other items, according to the Calhoun County Courts. Do not list life insurance policies, joint bank accounts or property held in trust, as these items pass to the other owner or beneficiary automatically when you die, according to Legal Aid of Western Michigan. Specifically state the names of children you want to exclude from inheriting under your will, and state that you are excluding them intentionally. If you do not make it clear that you intend to leave a child out of your will, the probate court will assume you simply forgot to mention that child and will give the child a share of your property after your death, according to the Calhoun County Courts. Michigan law will not let you exclude your spouse from receiving a share of property after your death, even if you mention the spouse specifically, according to the Calhoun County Courts. Add a residuary clause. A residuary clause covers any property you did not specifically mention in your will. A typical residuary clause may state, "I leave the rest, residue and remainder of my estate to ..." followed by the name of the person who is to receive it, usually a spouse or child, according to the Calhoun County Courts. This clause "ties up loose ends" by ensuring that no part of your property gets left out of your will by mistake. Sign your will. If your will is handwritten, or "holographic," you may sign it yourself without witnesses and Michigan law will recognize it as valid, according to FindLaw. However, if your will is typed, do not sign until you are in the presence of at least two witnesses. 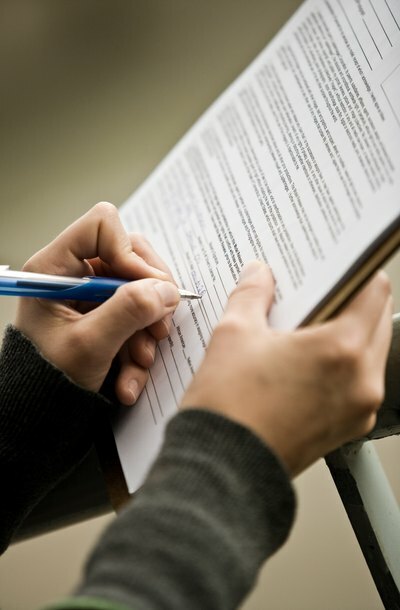 The witnesses should watch you sign, then sign beneath your name and include a sentence that explains they know who you are and watched you sign your will, according to Michigan Compiled Laws Section 700.2052. Your will is a document that explains how your property should be handled after your death. Preparing your will can be a complicated process, especially if you have children or significant assets. Following guidelines or checklists for preparing a will may help you and your attorney ensure that nothing is left out and that your instructions are clear. A will is a document that explains how you want your property distributed when you die, according to the American Bar Association. It may also explain who should take care of your estate's business, who should take care of your minor children and similar matters. Understanding the most common questions about wills can help you ensure you're making solid estate planning decisions for you and your family. Consult an attorney if you have any remaining questions about wills. Is a Do-It-Yourself Will Legal in Wisconsin? Wisconsin law sets out certain requirements that a will must meet before a Wisconsin probate court will accept it. A do-it-yourself will is legal in Wisconsin as long as it meets the requirements listed in Wisconsin law. The Wisconsin State Bar recommends talking to an attorney before preparing your own Wisconsin will.